This post is sponsored by Vital Proteins. All opinions are my own. So sorry to be bringing you two sponsored posts in two days, but it’s how the timing had to work out for this month. Definitely keep reading — you don’t want to miss this one. 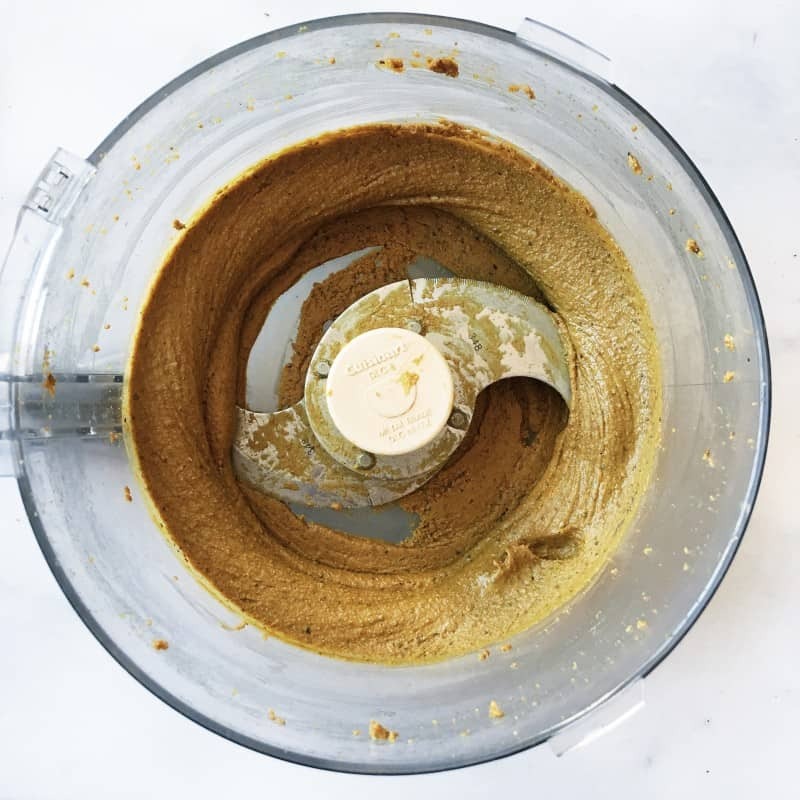 I don’t know why I started out with almonds when making nut butters at home. They’re the most time-consuming (albeit it the most delicious) and I ruined parts of my kitchen in the initial experimentation. After getting proficient at almond butter, I realized how much easier it was to make other nut butters at home. I experimented with walnut and cashew flavors, and when going through my cabinets over the weekend I found a huge bag of pistachios I had totally forgotten about. So, as a totally normal thought, I wondered CAN I MAKE BUTTER OUT OF THIS? IS IT A THING? DO PEOPLE DO THIS?? Turns out, they do. Anyway, I’m getting off track here. 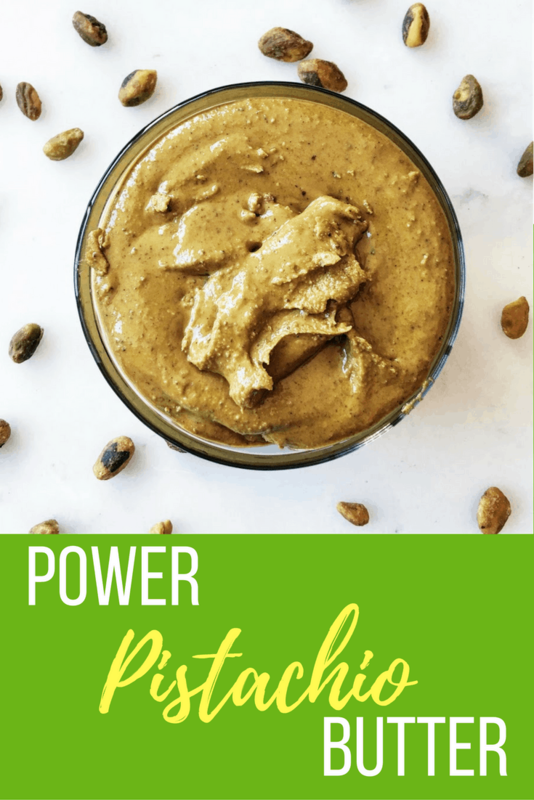 Basically this is the easiest nut butter recipe I’ve ever made. Typically, I will buy raw, unadulterated nuts and then roast them and add a little salt in the processing phase. Since the bag of pistachios I had was already roasted and salted, I just popped them in and went to town. I did add a little maple syrup as I usually do, but that’s it. BAM. EXCEPT — I love me some Vital Proteins, which I’ve talked about on a monthly basis on this blog. Their collagen protein is the best in that it is unflavored and I can add it to ANYTHING. So I did. 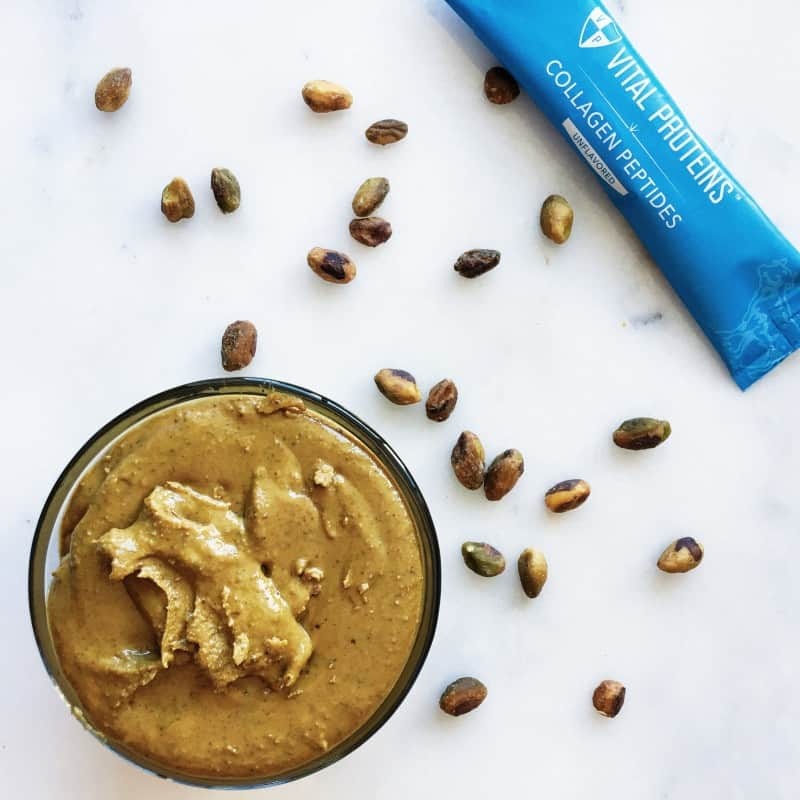 The “power” in this power pistachio butter comes from the addition of their collagen peptides — now available in these cute little to-go packets. One packet contains 9 g of protein, so with every delicious bite of this butter, you’ll be doing your body a solid. I’ve been enjoying this on English muffins by itself or with a little bit of jelly. It’s mild, yet delicious, and will probably be gone this week. Place nuts and powder in processor and turn on. Leave running until the nuts begin to break down into a smooth butter (~10 min). 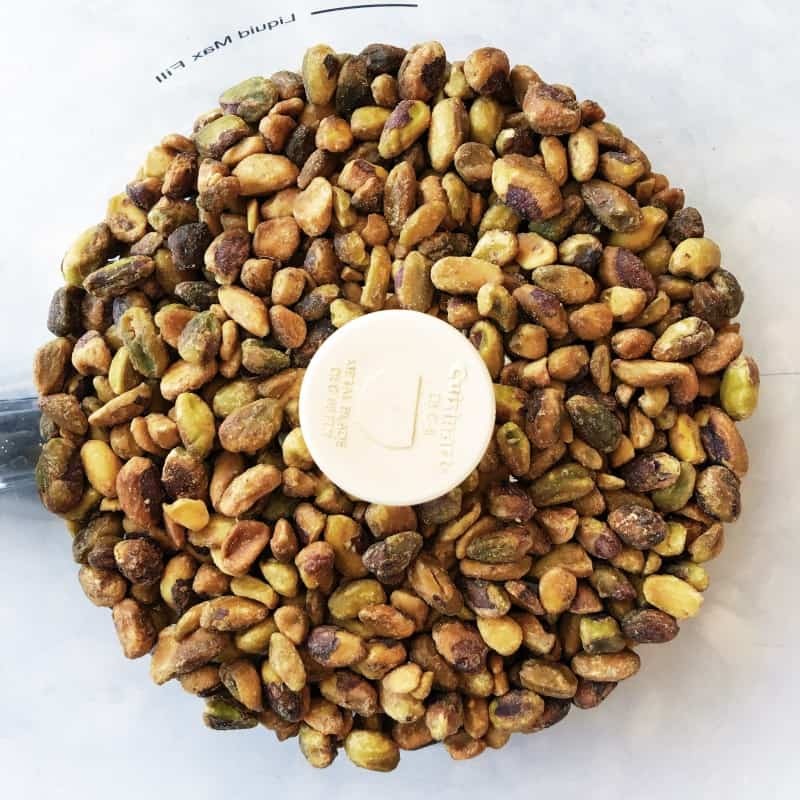 *If you have raw pistachios, I would recommend roasting them at 350 degrees for about 10 min and adding 1 tsp of salt to the first step (or to taste). Have you ever had pistachio butter? How do you eat it? WHAT NUTS SHOULD I USE NEXT? I love pistachios, and I have indeed had pistachio butter before and it is amazing! Love adding VP to the mix! Yum! I wish I had a jar of this to top on my oatmeal this morning. Why are pistachios so under used? I know! I was like how have I not thought of this?? i want to make pistachio butter, i REALLY do. but i’m just so CHEAP and pistachios are like the most expensive nut in the world. i can’t bring myself to buy them and then blend them all up. UGH. Y U do dis 2 me. That sounds delicious! On my list! OBSESSED. Pistachios are my favorite and I go through almost a pound a week on my own. It’s not a problem. Then this has your name written all over it!